So much goes into training, both physically and mentally that after months of preparation and sacrifice, crossing that finish line is a feeling like no other! We all decide to run races for different reasons. Some to keep the weight off and stay in shape. Some to prove to themselves they can do it. Others love to run with friends and family for more of a fun, social event. And some do it because they like the competition, with themselves and others. 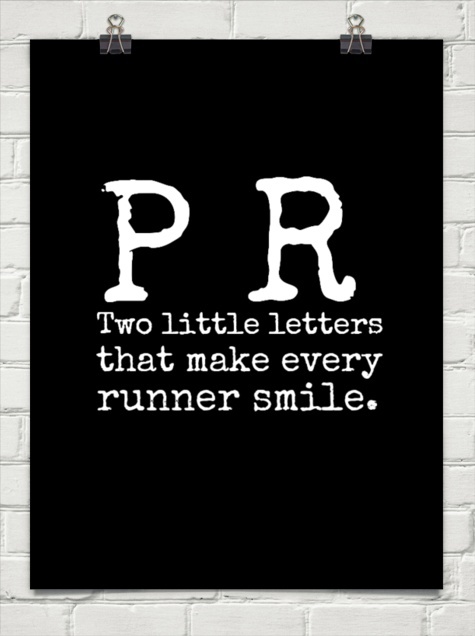 Regardless of the reason we begin training for an event and despite how competitive think we are, or are not, one thing is certain for every runner…PR’s are AWESOME! [In case you are newer to running, “PR” stands for personal record.] PR’s show us what we are capable, they show us that discipline and hard work pay off, that we are both physically and mentally stronger than we ever thought possible. PR’s also give us a new lease on our running, it revitalizes what may have become stagnant and gives us new goals to reach for! As a performance coach and avid runner myself, I am often asked for tips on how to get faster. Just like any run training programming, there is no one-size-fits-all magic formula that works for every person and every event. But over the years, I have managed to see some significant improvements in my own pace as well as in my clients’, so I figured I would share a few things I have found to be helpful. I know this may sound a little contradictory, but you need to have big, scary goals to shoot for. Even though these goals may frighten you a little, they really are not too much out of your reach if you’re willing to work! So first and foremost, with running and any type of training, you have to set some action goals. In an past blog post, I discussed the importance of S.M.A.R.T. goals and running is no exception. Setting a goal too high will cause unnecessary stress in your training and potentially set you up for failure. It could also lead to over-training, burn out or even worse, an injury (been there done that). And of course setting your aim too low doesn’t give you that edge you need to step out of your comfort zone. After all, the joy in PR’ing is pushing yourself and making it happen! Use some of your past events and training runs as a good litmus test for your goal. Take some of your paces from your best training runs and consider how many seconds you could shave off each mile if you really pushed it out there. Use some “reverse engineering” with a pace calculator to determine what your PR would be if you shaved off that amount of seconds per mile. Now that you have set your goal, here are some things to do to make it happen! I cannot stress enough the importance of cross training. And I am not just talking about swimming, biking and other cardio. Getting in the weight room has been hands down one of the absolute most important components of my increased pace. Since incorporating strength and conditioning into my regular training, I have gotten leaner, stronger, more powerful and thus faster. Runners often shy away from lifting, especially heavy, because they fear they will bulk, be too sore or don’t think they have time for it. None of which is true, trust me. Strength training will increase lean muscle mass, improve bone density, and increase strength and power, all of which improve running economy. Body weight exercises like squats, push ups, planks, lunges, etc., are all a great place to get started if you have never done a strength program, but eventually you will need to incorporate resistance with dumbbells, kettle bells, medicine balls, etc. Remember, don’t be afraid to lift heavy (for example: 4 sets of 6-8 rather than 3 sets of 15-20), push yourself in the weight room, not just the trail! They old saying goes, “you can’t out train a poor diet,” and that couldn’t be any more true. As runners, we have a tendency to think “hey, I just ran 10 miles, I should be allowed to eat all the food.” Obviously it is vital that we are refueling our bodies, making sure we are replenishing all those calories we just expended, but we must do so with the right foods and the right balance. A good example is when I trained for my first marathon back in 2010. After each long run, I plowed through countless unhealthy foods, thinking it was all evening out. I’m not one to pay attention to the scale, but as I noticed my clothes getting tighter and tighter, I knew I had probably put on a few pounds. Race day came and went and I felt it went well for my first marathon, but at doctor’s check up about a week later, I realized I had gained over 10 pounds during training! That was a very humbling experience for me and since making adjustments to my nutrition, I have managed to keep my weight down and continually shave my time. Be sure to eat real food, drink plenty of water and keep your portions in check.. Avoid processed foods, added sugars and alcohol. Also avoid the urge to devour everything in sight after a long run. Have your post run meal planned out and include tons of water along with the meal to prevent overindulging. If you’re still struggling with portions and nutrition, I highly recommend downloading the MyFitnessPal app to track your diet. What gets measured gets accomplished! Long, lean, limber bodies are important for running, not just running efficiency but also recovery. Yoga provides not just flexibility and strength, but it offers a connection to your body, mind and spirit like no other form of fitness can. You became amazingly aware of your body through Yoga, thus learning how to better listen to and train it. Yoga helps to increase range of motion, improve posture, increase strength and increase stamina, all very important for running and recovery. If you have never done Yoga before, start of slow and gentle. There are several resources online as well as DVD’s you can try. Consider attending a class at a local studio and don’t hesitate to inform the instructor if you are new, so they can be sure to keep an eye out for you. I myself, am a huge fan of Hot Yoga. The high temperatures quickly warm up my muscles allowing me to get deeper into poses and the continuous flow of the class challenges and pushes me both physically and mentally. Adding at least one Yoga class to your weekly training routine will offer great benefits for your body and mind! Whether you run 7 minute miles or walk/run 14 minute miles, you are a runner regardless and can certainly benefit from speed work. Speed work typically involves short but fast intervals of running followed by a recovery period. Through a carefully designed program, you will be able to increase your stamina and speed, as well learn to tolerate both the physical and mental discomforts while racing. The focus while doing speed work is to reach your anaerobic threshold, which requires you to run at a MUCH faster pace than usual. Pushing yourself hard to reach this threshold will improve your VO2 max as well as your aerobic capacity, both very important for distance running. Speed work, however does come with risks. If not done progressively and properly, it can lead to over training and potentially injury. Be sure to research speed programs before engaging in one and my suggestion would be to consider hiring a professional (see #7 below). Running with someone who is a little faster than you and willing to help you push to reach your goals is a sure fire way to make it happen. And the best part in doing so, is having someone to celebrate the experience with! Of course, be sure to return the favor one day, by helping someone else get their PR too. If you do not already have someone in mind like a BRF (Best Running Friend), consider joining in a running group. You’re sure to find people to pace you and push you in large groups, plus they are a lot of fun! Running and performance coaches are not just for the elite athletes. Don’t think for a second that just because you are not working towards Olympic status, you cannot enlist the help of a professional! Coaches are available to offer guidance, programming, support and encouragement to runners of all ages, distances and fitness levels. Running coaches will work specifically with your running needs and goals to train for a particular event. From those goals, your coach will design a specific plan of action including mileage build up, speed work, tapering, etc., to help keep you on track safely and effectively. A performance coach, like myself, will get you stronger, leaner, more powerful and of course, faster. Performance coaches design sports specific strength and conditioning programming to target what is needed to take your “game” to the next level. Again, we are not just for competitive athletes. Performance coaches work with anyone looking to improve performance by building lean muscles mass, improving strength and power, increasing flexibility and improving aerobic capacity. You’ve set your ambitious, yet attainable PR goal and you feel as if you are doing everything right to make it happen. But for some cosmic reason, it just didn’t happen at your last race, or the previous one even the one before that. Now you’re thinking your goal is too high, it isn’t going to happen and you’re just not the runner you thought you were. DON’T beat yourself up and DON’T give up! Maybe you were over trained, the weather was horrible, your head just wasn’t in it, things happen…learn from them. Evaluate the various factors of race day and the days leading up to it, that may have come into play causing you to come up short. For the things you can control, determine what you need to do to change them, ie: footwear, attire, music, pace groups, training program, etc. And for the things you have no control over, it’s important you are equipped with the right mindset to deal with it. You can’t change the weather, there is nothing you can do when you are sick, sometimes courses are just way harder than we anticipated. Being prepared, having a positive, no excuse attitude and just staying focused and persistent will sooner or later (hopefully sooner) get you that much deserved PR. So no matter what, never, ever give up!